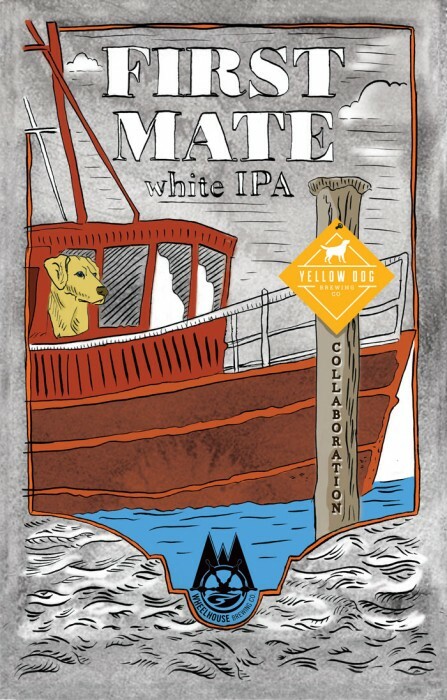 Design and Illustration for Wheelhouse Brewing Co.’s ‘First Mate White IPA’ a brewing collaboration with Yellow Dog Brewing Co. The brief was simple ‘a yellow dog in the wheelhouse of a fishing boat’, I drew it with pen and paper, scanned in to clean up and add colour and texture. The style is interesting, a bit of a comic page style. I maintained Wheelhouse’s customary logo framing, with a rougher sea in behind. Adding visual tension. This beer was destined for festivals and on tap only, so a banner was in order, not a bottle label. 12″ x 18″ with grommets.